RPMS provides programs in the Montessori method for children ages 2 through 14. Children are placed in multi-age classes, a fundamental hallmark of Montessori education. These mixed age groups provide for peer teaching, role modeling and leadership experience, and for an enhanced sense of community within the classroom. By interacting with children of varying ages, a child learns to understand and respect her place in a community that extends beyond the students in her same "grade." As a younger member of the classroom community, the child learns from observing and interacting with older classmates. By the time the child becomes an upperclassman, learning is reinforced by providing an example to younger children. Multi-age classrooms permit a child to build special, long-term relationships, which cultivates a sense of belonging to a learning community. The very young child is often apprehensive about leaving parents or caregivers. The Toddler Program helps the child make a gentle transition from the family setting into our community. The toddler environment is carefully prepared as a natural extension of the child's home. Teachers take great care in providing a nurturing, safe, and comfortable environment, while at the same time sparking the child's curiosity using a variety of materials and activities to aid in the development of the young child. Activities are geared for children between 24 to 36 months, and foster their natural desire to be independent and self-confident. Children soon learn to take pride in the ability to "do it by myself," as they master many of the Practical Life activities such as: hand washing; pouring water, food preparation, and dishwashing. Children do not need to be toilet trained to attend this program. Maria Montessori described the learning of children ages 3- 6 like that of a sponge, soaking in knowledge from all their senses. Cultural subjects are integrated into the child's daily experience, which includes gross motor activity on the playground or gym and a morning snack. Activities are designed to nurture self-confidence, concentration, independence, and respect for each other and the environment. The Children's House rooms are staffed by a Montessori certified teacher and an assistant. Children must be three years old by September 1st and toilet trained before entering the program. For children ages 3-6, the school becomes an extension of their home. Carefully designed activities reflect the special effort given to following the natural pace of the child. Children staying for daycare (Bamboo Room) transition to lunch, and then have free time on the playground or in the gym. Children who stay for a full day program (and are age 3 by September 1) nap from 1:00 to 2:45. Children bring a blanket, a pillow, and if they like, a toy to sleep with and keep at school. After nap time, the children often spend time on the playground or in the gym. In general, it is a more social time where friendships are cemented and children learn valuable social skills. The Children's House all day program provides special group projects such as cooking, art, and imaginative play. Children who are age 4 by September 1 and stay for the full day program are in Siesta. The children rest and enjoy read aloud, and then participate in seasonal outdoor activities. The Extended Day Program is for children who are age 5 by September 1. This program builds on the learning that takes place during the 3 year cycle. Five and six year olds, who are leaders in the morning 3-6 classroom, challenge their intellect and extend their attention span in the afternoon with activities designed for older children. Children's social relationships are nurtured, and aided by an ever expanding vocabulary that enhances exploration and problem solving. Extended Day allows children to utilize the skills they have learned over the first two years of the 3 year cycle, such as the application of beginning phonics, story telling, handwriting, and numeric skills to do more advanced work. The Lower Elementary environment builds on the skills and knowledge attained in Children’s House. It is during Lower Elementary that foundational literacy and numeracy skills blossom into reading and mathematical competency. Through Montessori’s Great Lessons, students are exposed to the entirety of our universe’s history. Students are encouraged to explore their interests, while learning to organize, plan, and complete daily work. Tools for independent time management are introduced, and teachers and students work together to set expectations for a harmonious classroom community. Students move further toward independence by learning to navigate social relationships and solve conflicts utilizing the strategies and language of peaceful resolution. By embracing their citizenship in a diverse world, our hope is that Lower Elementary students move towards genuine intellectual curiosity. The 6-9 Montessori environment is rich in opportunities to interact with language. Skill development occurs as students engage with a variety of resources in the classroom designed to foster language development. The foundation of the language curriculum is steeped in Montessori philosophy and materials; yet, as with all practices, RPMS works to evaluate current research in education, child development, and learning in order to ensure an enriched academic experience for students. The program is designed to build skills in the area of oral and written competencies as well as reading fluency. A focus on phonemic awareness and fundamental reading comprehension are the foundational skills built over several years. Books and vocabulary enrichment activities abound across curricular areas. Learning to read and to convey thoughts in writing provide keys to independence and avenues for exploration of the world. The 6-9 student continues to build her understanding of the processes and concepts of mathematics through interaction with concrete materials in the classroom. The concrete Montessori math materials support the child's work from physical representation toward abstract understanding. Once the student has mastered a concept with manipulative materials, she moves on to abstract pencil and paper problem-solving. Emphasis is placed upon building a deep conceptual understanding of operations and processes. In addition, children build proficiency with math facts, lessons on number strategy, and memorization. Building a strong foundation for mathematical concepts leads to greater understanding, enjoyment, and confidence. The Montessori “Cultural” curriculum encompasses botany, zoology, geography, and history. The students’ studies in this area begin with Montessori’s “Great Lessons” and the story of the formation of the universe and all living things. These lessons are the gateway to all studies in the cultural area. Through these great lessons, students begin to develop an understanding of their place in the world physically: in terms of location and history, and in relation to the age of the universe. Students develop an appreciation for other peoples and cultures through continent studies, learning how geography and time have influenced the ways in which peoples meet their fundamental needs. Montessori’s Cosmic Education helps children understand the interdependence and interrelatedness of all people, plants, and animals. Following our Montessori day, the Explorers program provides after-school care (Monday-Friday 3 pm to 6 pm) for children in first through eighth grades. This highly sought after program offers unstructured time for self-directed play under the watchful (yet unobtrusive) eye of caring adults. We begin the afternoon with time on the playground, weather permitting or in the gym. Snack is served every day, with special treats on birthdays and holidays. There are three multi-age classrooms where age-appropriate games, art, and other materials are provided for children to choose from, as well as seasonal cooking and craft projects. Whether playing with friends or making new ones, children make up their own games and play by their own rules. Self-initiated projects, such as organizing clubs, elections, and talent shows or just "hanging out" with friends and getting a head start on homework are all options. Students learn to knit, sew, and crochet, write stories, and create newspapers. Activities vary depending upon student ages and interests. There are ample opportunities to practice social skills such as problem solving, winning and losing graciously, sharing, and getting along with others. Several much anticipated events punctuate the year. Children participate in the many tasks of organizing a food drive (collecting and packing donations) with great enthusiasm. We celebrate several holidays including Halloween, Thanksgiving, winter holidays, and Valentine's Day. Each child is celebrated on their own special day on or around their birthday or half-birthday. The year culminates in our own "Moving Up" ceremony and ice cream social at the end of school in June. The Upper Elementary program expands on the skills and knowledge attained during the Lower Elementary program. Opportunities are provided to explore new ideas and topics, inspiring students’ natural curiosity about the world and championing their desire for independence. The development of social skills and the ability to make a positive impact on students’ communities become critical during Upper Elementary. RPMS works to instill in each child a sense of investment both in her/his academic work, and in the work of creating a more peaceful world. Academically, our school works to teach students how to learn by placing equal value on the process and outcome. We aim to create independent learners, proficient at managing their time and advocating for their needs. Teachers collaborate with students to evaluate classroom work through reflection and self-assessment. We encourage students to look beyond the classroom and recognize the richness of our world and the wealth of learning opportunities it offers. The transition from lower to upper elementary is often described as progressing from "learning to read" to "reading to learn". Children of this age have moved beyond mastering the basics and can now look to texts and literature to expand their understanding of academic disciplines. As is the case in lower elementary, the opportunities to read and learn span math, history, science, and geography. Critical thinking skills, analysis, and evaluation emerge as dominant modes of inquiry. 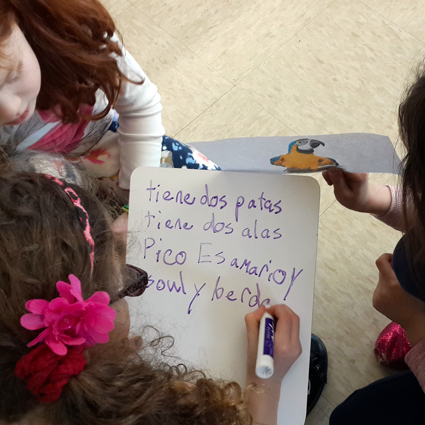 Similarly, upper elementary students begin to learn the varied ways in which we communicate in writing. Anchored by the story of the evolution of language, students learn nomenclature specific to each area of study and investigate the etymological origins of vocabulary. While expanding written expression, students practice narrative, expository, and persuasive writing. Complex sentence analysis explores the roles that different parts of speech play, differentiating simple from complex sentences. Students also begin to edit their own work both for grammatical and organizational continuity. Upon completing Upper Elementary, students skills with reading and writing extend their independence in exploring ideas and passions. Students in Upper Elementary begin to move from a concrete understanding of numbers and operations towards an abstract understanding. 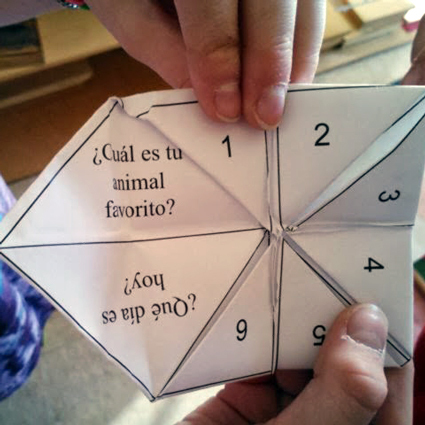 They shift away from hands-on manipulative materials towards more abstract computation. The conceptual groundwork laid by these manipulative materials provides the foundation for the study of decimals, fractions, and percentages. The focus remains building an understanding of concepts before navigating operations. Students investigate the relationship between place values and the reciprocal nature of operations, data collection, interpretation and representation, measurement, and basic algebra. Upper Elementary is also a time to apply problem solving skills to real world situations. Students often venture into the community to put their classroom skills such as computing costs, tabulating survey results, comparing graphic representations of data to work. In an effort to prepare students for future studies, textbooks are introduced during Upper Elementary to expose students to varied algorithms and problem formats, and to gain comfort and familiarity with textbooks themselves. The 9-12 environment is rich with materials designed to spark the students’ imagination and pique interest in the world. Building on studies about formation of the universe and the timeline of life, students begin to explore the history of humans from ancient civilizations to present day cultures, further understanding a “Cosmic Task.” The cultural areas of the curriculum are divided into studies of geography, history, and science. Students deepen their understanding of their place in the world physically, spatially, historically, and in relation to the age of the universe and all that inhabits our earth. Students develop an appreciation for other people and cultures through civilization and biome studies, learning how geography, climate, and local conditions determine people's most basic needs. Children also learn the interdependence and interrelatedness of all living things through the studies of people, plants, and animals. This aspect of the curriculum is enhanced by local field trips, overnight trips to nature centers, and school projects. 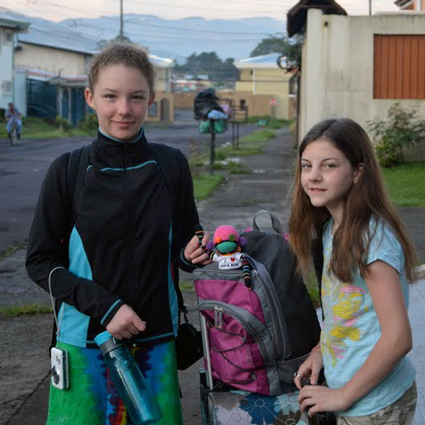 Such trips and project work allow students an opportunity to experience the real world, and helps to identify abstract concepts they learn about in class. Teachers’ willingness to capitalize on students' innate curiosity and desire to understand their world underscores the beauty of a Montessori program. The RPMS Middle School program is designed to meet the needs of the adolescent, and is grounded in the Montessori curriculum while taking into account Illinois State Standards. To achieve these goals, the program integrates current research in adolescent development, trends and issues in education, and Montessori philosophy. The mission of the program is to provide opportunities for adolescents to be self-confident and gain self-knowledge, to belong to a community, to learn adaptability, to be academically competent and challenged, and to create a vision for their personal future. Grades and tests are introduced in Middle School. These, along with portfolio projects and group work, are used to assess student progress. Counseling and orientation to help students prepare for and select an appropriate high school begin in 7th grade. Language arts include the study of vocabulary, literature, grammar/mechanics, writing, and public speaking. The middle school curriculum aims to develop an in-depth understanding of both written and oral expression. By developing proficiency of common word elements, an aptitude for proofreading and editing, and a sophisticated vocabulary, middle school students are well prepared to compose prose, poetry, and informative writing. Analysis and discussion of classic literature, nonfiction, news articles, and speeches helps students hone their ability to dissect the written word by examining both literary devices and topic-specific content. Research skills, both individual and collaborative, culminate in a large scale written projects presented to the class. Public speaking is an integral component of the middle school program, bolstering confidence and sharpening techniques. At the middle school level the math curriculum is designed to help students move from the material-based approach used in Upper Elementary classes toward more abstract concepts and processes. Students work primarily from textbooks, and have nightly homework in math. The Middle School philosophy allows students to progress in math as quickly as they can, but to go as slowly as they need to ensure accuracy and proficiency are established. Math is taught in small groups. The in-class lessons include group problem-solving, mental math, graphing, tessellations, compass constructions, and logic. The RPMS Middle School curriculum promotes cross-disciplinary reflection by connecting distinct subjects under a common theme each academic cycle. Each cycle is approximately seven weeks long, and there are five cycles each school year. The cycle format is designed to help students develop organizational, decision-making, and time-management skills. Every cycle students integrate work with language, literature, math, science (called Natural World), social science (called Social World), Spanish, and a variety of co-curricular subjects including art, music, drama, and gym. Literature, Natural World, Social World are united under the cycle theme. As often as possible, practical life learning occurs through a health curriculum, internships, and travel. Middle School students’ work is divided into two types: individual and group work. Individual work includes language, math, most literature and Spanish assignments, and a small portion of Natural and Social World work. Homework, project grades, and mastery learning are assessed on an individual basis. Group work is done in mixed age, gender, and ability groups, in which individuals learn to work together to achieve a common goal. Groups are assessed on their presentations and projects. The RPMS Spanish program is recognized by the American Council on the Teaching of Foreign Languages Global Engagement Initiative. 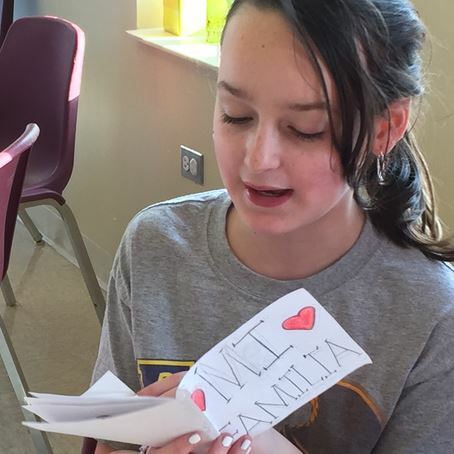 In alignment with with the ACTFL World Readiness Standards, the RPMS Spanish program focuses on interculturality, Spanish language proficiency and critical thinking. Spanish classes formally begin in Extended Day. RPMS understands that successful language development and acquisition occurs over many years. By the time the children graduate 8th grade, the goal is for them to function at the Novice High/Intermediate Low levels of oral proficiency in class, which the majority of our students achieve. What does this mean? Intermediate speakers of a language are know as "survivors": they can survive in the target culture. The speaker can ask and answer questions, and can speak in discrete sentences and strings of sentences on topics that are either autobiographical or related primarily to her/his immediate environment. Regular Spanish class meetings begin in Extended Day, where children learn to enjoy language learning, express feelings, and use basic phrases to communicate and greet each other. Extended Day children meet weekly. Belonging: What makes a family? Challenges: What does the world eat? Challenges: What makes a responsible traveler? Identity: What makes a good friend? 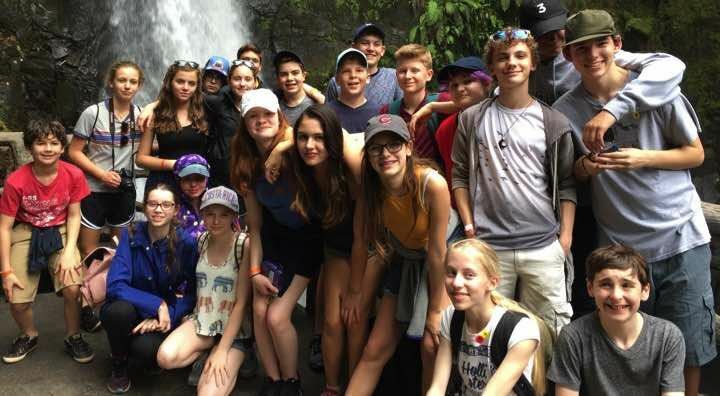 8th grade students participate in an immersion trip to Costa Rica during the spring of their final year at RPMS, experiencing real-life use of Spanish and developing interculturality. 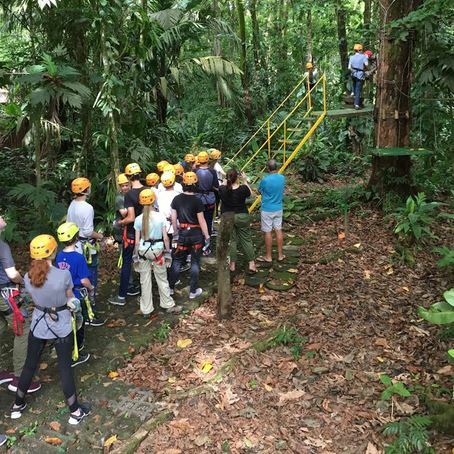 The students stay with Costa Rican families, attend language school, connect with middle school students in San Jose, volunteer in the city orphanage, and experience the astounding natural wonders of the country in an excursion to Tortuguero National Park. At all levels, we seek to make global connections through the Peace Corps volunteer pen pals, E-pals, and International Pen Friends. As technology continues to enable easier communication, opportunities for global engagement in the Spanish program are increasing. 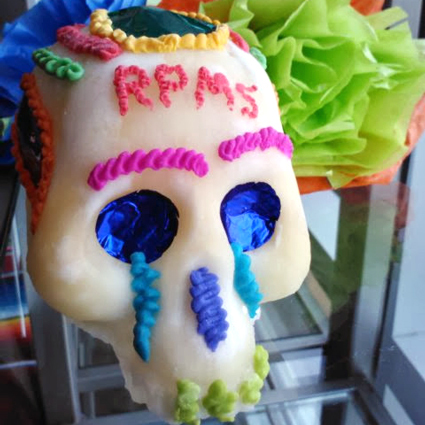 Here in Chicago, students visit the National Museum of Mexican Art in Pilsen, attend Spanish-related arts performances, and participate in the annual Día de Muertos celebration at school. This way of learning is very different than the way most of us experienced a language class in middle school or high school. You will not see textbook, conjugation charts, or workbook pages with grammar drills. The children are learning language in the context of authentic activities in which they use the language as the vehicle for study. Communication and global competency are the focus. This approach to language teaching is based on the most current acquisition and teaching research. The mission of Rogers Park Montessori School’s Arts program is to enrich and nurture our elementary students to successfully appreciate and practice the arts while supporting their academic growth. Diverse perspectives and individual ideas are celebrated and encouraged within our art, music, and drama programs. Through the prepared environment and whole child developmental approach to learning, each student is given multiple opportunities to develop their individual artistic expression. The Arts at RPMS promote creativity, collaboration, risk taking, and problem-solving. Our programs develop artistic literacy for the whole child through curricula that integrate the arts with Montessori philosophy and methodology. Our aim is to foster growth in the students’ artistic skills and creative thought process. Arts programming offers our students a rich and comprehensive curriculum in visual, musical, and dramatic arts. Our ultimate goal is the development of creative young adults who will enjoy a lifelong interest and appreciation of the arts. Our programs help students cultivate their individual skills, talents, and interest through critical thinking and specialized instruction. RPMS is an affiliated member of the NAEA: National Art Educational Association and NAfME: The National Association for Music Education. The arts encourage each of our students to work in a creative, cooperative, and collaborative manner while promoting expression through independent thought. A strong Montessori program supports the artistic potential of our students through the exploration of the prepared environment in art, music, and drama. While preserving the three-hour Montessori work cycle in the morning, RPMS offers daily afternoon instruction in the arts. Independent projects are integrated within the classroom curriculum. Students learn best in a safe and creative environment with caring specialists that teach to the whole child without formal assessment. Arts programs are based on National Standards, and are guided by TAB and choice-based art guidelines. Instruction by practicing artists with high standards in teaching and learning enables each student to reach his/her full artistic potential. The beauty and vulnerability of the process is valued and celebrated as much as the final outcome of the student work. The arts program fosters community with all-school art initiatives, performances, and community philanthropic partnerships. Our Physical Education program focuses on integrating health and exercise into the schedule. Additionally, the PE curriculum reinforces central tenets of Montessori philosophy such as independence, cooperation, and group problem solving. The improvement of gross and fine motor skills, which are practiced starting in early childhood classes, continues as a guiding principle for PE activities. 6 - 9 year olds learn a combination of different motor patterns. Classroom lessons, especially the cultural curriculum, are reinforced for this age group. 9-12 year olds engage in sports familiar in American culture then learn corollary sports from around world. Different rules, customs, and traditions provide a window into other cultures. Middle School students engage in creating their own version of sports and exercise programs. Their PE curriculum highlights game invention and designing and planning an effective exercise program.